From the authors of the cult classic TRANCE Formation of America. With their lives and liberty on the line, TRANCE was hurriedly condensed from courtroom testimony into a book form and privately published by the authors in September 1995. 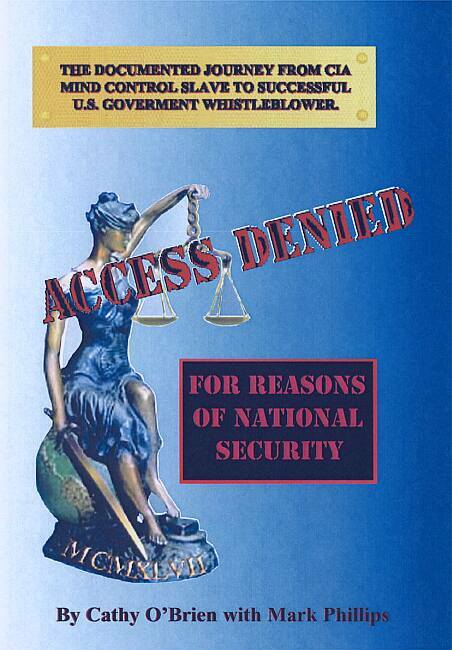 ACCESS DENIED For Reasons of National Security is the rest of their true life's story, which required 16 years for the authors to survive and 3 years for them to write. This book is an amazing testament to the strength of the human spirit and one you will never forget for as long as your thoughts remain free. While TRANCE has become known worldwide in many licensed translations as one of the most successful US government whistleblowers' book ever written, it was never intended for the public who had no reference for understanding mind control nor was it to be considered a book. Rather it is what it is, a true and to date uncontested document for the US Congressional Permanent Select Committee on Intelligence Oversight. TRANCE is Cathy O'Brien's documented testimony she provided to US courts, US Congress, and the United Nations Commission on Human Rights Abuses of her existence as a CIA MK-Ultra mind control project's slave. ACCESS DENIED is a real book of answers, solutions and positive hope for all of u.s. and our allies around the world. This book was written for everyone and especially for the thousands who have read TRANCE and were left to imagine pertinent details that could not be included. How did Cathy recover from being tortured "out of her mind" until age 30 when intelligence insider Mark Phillips triggered and rescued her and her daughter Kelly away from their CIA operative handler? What are the documented details of how Mark & Cathy survived the state and federal and Congressional judicial gristmill aptly called the criminal justice system? Last but not least, what are the facts as to how Mark & Cathy were able to survive long enough to globally expose the criminal acts of some of the most politically powerful people who are still in control our planet to this very day? 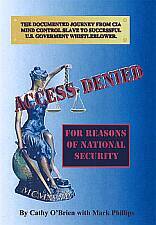 ACCESS DENIED is a whistleblowers' living guide to success.